In the Amazon EC2 console, choose Instances from the left pane, select the SAP Business One client instance (named WINClient), and note its IP address. Use the remote desktop connection from the RDP instance to connect to the SAP Business One client. Enter the IP address of the SAP Business One client instance, and log in as Administrator. The Administrator password for the SAP Business One client instance is the same as the password you entered for the SAP HANA database and SAP Business One during the template launch. You may want to change the password later for security. In the desktop of the SAP Business One client instance, double-click the shortcut to the SAP Business One client software to launch the client. When prompted, enter the name of the landscape server that you specified for SAP HANA and SAP Business One while launching the template. Leave the port unchanged. The AWS CloudFormation template automatically adds a hosts file entry in the SAP Business One client machine to resolve the SAP Business One server name. Choose the default company database (refresh your screen if necessary) and enter the default user ID and password (manager/*******) to log in to the SAP Business One client. When the AWS CloudFormation template has successfully created the stack, the SAP Business One, version for SAP HANA, Linux node will be running with the software installed in your AWS account. To connect to the SAP Business One, version for SAP HANA, Linux node, use SSH to connect to the NAT instance. In the Amazon EC2 console, choose the NAT instance, and then choose Connect. 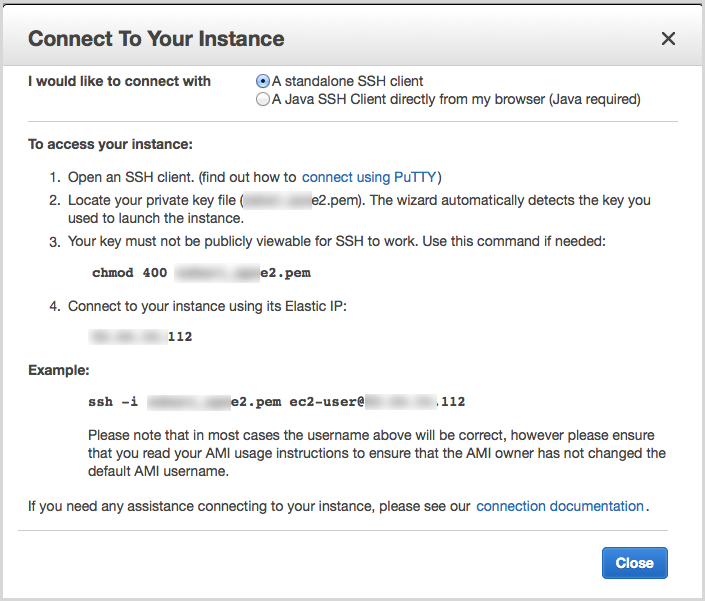 You can then connect to the SAP Business One, version for SAP HANA, Linux instance in a similar way: Choose the SAP HANA instance from the Amazon EC2 console, and then choose Connect to find the SSH command. It is important to schedule a backup of your newly created SAP HANA database to ensure that your data stored in the SAP HANA database is safe. The Quick Start deployment creates a backup file system (/backup) in your SAP HANA database instance. You can schedule your SAP HANA database backup and have it store the backup data at /backup. We recommend that you copy the backed up data from /backup to your own Amazon Simple Storage Service (Amazon S3) bucket to ensure that your database is protected in the case of Availability Zone failures. When you copy your data to an S3 bucket, it is automatically replicated across multiple Availability Zones within a region for maximum availability. Follow the instructions outlined in the SAP HANA Administration Guide to schedule and maintain your HANA database backup. There is an additional cost for Amazon S3 storage. See Amazon S3 Pricing. This Quick Start installs the 64-bit version of the SAP Business One, version for SAP HANA, client on the Microsoft Windows client instance. If you need additional client applications (for example, SAP Business One Studio, Software Development Kit, Data Transfer Workbench), you can install them manually. Drive D on the Windows client instance includes the SAP Business One and HANA media. If you plan to use interactive analysis using Microsoft Excel for reporting, you must manually install Microsoft Excel on the Windows client instance. If you have any 32-bit add-on components for SAP Business One, you must manually install the 32-bit version of the SAP Business One, version for SAP HANA, client on the Windows client instance. If you want to use the Data Interface Server (DI Server) or Workflow functions, you must manually install DI Server and Workflow server tools on the Windows client instance or on a separate Windows instance. You can use the media drive mounted on the Windows client instance for your installation. If you want to use integration components, you can install them manually on the Windows client instance or on a separate Windows instance. If needed, you can install SAP Crystal Reports, version for SAP Business One, on the Windows client. Follow the instructions in the SAP Business One, version for SAP HANA, administrator's guide to get the latest patches for the SAP HANA database and SAP Business One.